Elementary Education under Tamil Nadu Educational Subordinate Services. Applications for this TN TRB BT Assistant Teacher Jobs will be received in prescribed format offline only. Interested and B.E.d With Degree and TNTET Paper 2 qualifying candidates may submit their applications to Tamil Nadu Recruitment Board in Person or before 10-05-2017. Selection for this vacancy of BT Assistant Teacher will be based on Marks secured in TNTET Paper 2 and other educational qualifications. 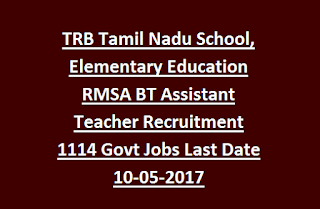 There are total 1114 BT Assistant Teacher vacancies available in this current recruitment of TN Teachers Recruitment Board. For more details about BT Assistant jobs of TN TRB see the below given details. 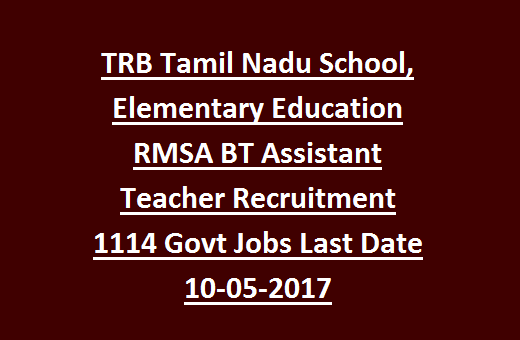 As per requirement of TN TRB Tamil Nadu State Teachers Recruitment Board, Total available BT Assistant Teacher posts are 1114. For all the subjects candidates must have qualified B.Ed and TNTET Paper 2. And should be able to teach in Tamil Language as well as English. Selection for this vacancies will be based on Merit in educational qualifications and TNTET paper 2 marks. Initially a Provisional Selection List will be prepared based on applications received and marks by candidates in qualifying exams. After Certificates verification Selection list will be prepared as per the norms and available vacancy. Candidates who are qualified TNTET 2012, 2012 & 2014 they are only eligible for this BT Assistant Jobs. For details refer official notification. Eligible and interested candidates may download the application form from TN TRB official website @trb.tn.nic.in. And fill all the details and attach the all necessary self attested documents and submit the application in person in TRB on or before 10-05-2017.